The NC State Computer Science Department is pleased to welcome the latest additions to the NC State University Department of Computer Science Student Ambassador Program. The Ambassador program is made up of sophomores, juniors, and seniors who serve as representatives of the department. The program promotes leadership and communications skills by offering students the opportunity to represent our department at a variety of academic, social and networking events held throughout the academic year, and through personal interface with prospective students through our outreach efforts. Ambassadors are the first point of contact for many visitors to NC State, so they are required to promote the University, the College of Engineering, the Computer Science Department, and the computer science discipline. Sophomores – Anna Chernikov, Alay Deliwala, Matthew Dzwonczyk, Sonali Karmalkar, Sarah Korkes, Jimmy Long, Richard Marshall, Oscar Molina, Anam Navied, and Claire Stewart. All Student Ambassadors are matriculated CSC undergraduate majors at the sophomore level or higher. Applications and nominations are taken in the spring and the competitive selection process includes an interview and group feedback from a special mixer event. Ambassadors work in one-year terms, renewable until they graduate, at the discretion of the department leadership based on overall participation, performance and academic progress. 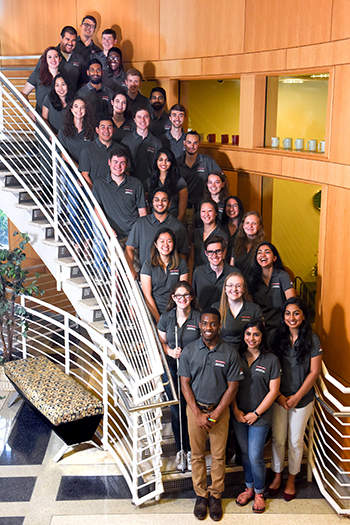 “The CSC Ambassadors play a critical role in the department's outreach and broadening participation initiative,” says Ken Tate, Director of Engagement and External Relations. “We are a large department with almost 1,900 students in the largest University in the state, which can be daunting to prospective students and their parents. Our ambassadors connect with prospects on a personal level and advise them on how to plug in to smaller communities of interest." Last year, CSC Ambassadors volunteered more than 700 hours of service engaging visitors at Open Houses, leading weekly tours for future students and their parents on 'Visit the Campus' days, serving as hosts and guides for countless departmental events, and even writing personal notes to all computer science intended accepted freshmen. Tate adds, "Every year, I talk to more and more students who tell me that it was an engagement experience with one of our ambassadors that made such an impact, that it led them to NC State." Tate notes that the percentage of females in the computer science undergrad program has jumped over 80% in the last decade. "Our ambassadors are making a huge impact on the life of our department every single day!" says Tate. The CSC Ambassadors would like to extend their appreciation to their ePartner sponsors for the 2018-2019 academic year including Allied Telesis, Allscripts, BCBS of NC, Blackbaud, Cisco, Credit Suisse, Eastman, LexisNexis, OneTrust, Red Hat, SAS, and VMware. Their support provides funds to cover special events, outreach-related travel, branded attire, service awards and a year-end recognition event. Sponsors have the opportunity to engage directly with the ambassadors group via structured opportunities such as dedicated mixers, panels, info sessions and/or development sessions. Learn more about each CSC Student Ambassador here.